Today, NewSpace companies are springing up almost on a weekly basis and there is a strong reason to believe that today there are over 1000 NewSpace companies around the world. They are embedding themselves across the value chain from upstream to downstream, with each of them trying to bring a new layer of innovation by different methods (e.g. low-cost COTS, agile-mass manufacturing, data fusion combined with machine learning, etc.). With a possible success rate of 5% of startups across the tech industry, the world could potentially see a cultural shift of larger community of entrepreneurial space ventures targeted with global B2B, B2C business models. Most of the NewSpace ventures tie the innovations they are bringing into space products/services towards a platform orientation where there could be network effects that can be exploited. For example, the vertical integration of upstream with downstream done by Planet gives them control over the entire supply chain of production (agile methods of construction of satellites) to provision (revisit, coverage, delivery) of medium-resolution imagery. 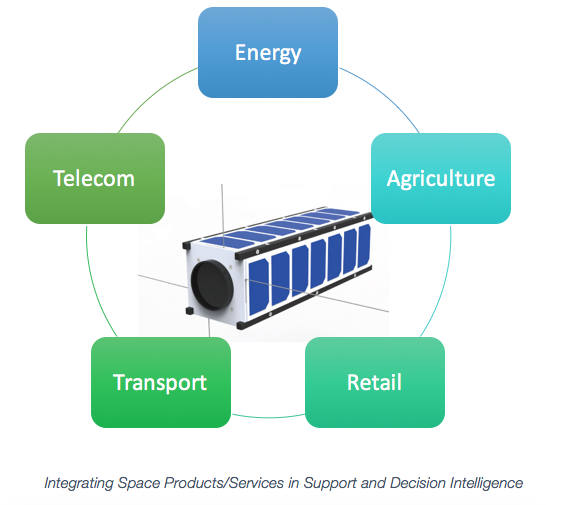 One of the strong pillars of NewSpace seems to be the dynamism around integrating space based products/services into traditional industries such as energy, agriculture, retail, transport, internet/connectivity, etc. NewSpace companies are planning to pick up on the buck where traditional space companies have flattened in technology and growth. 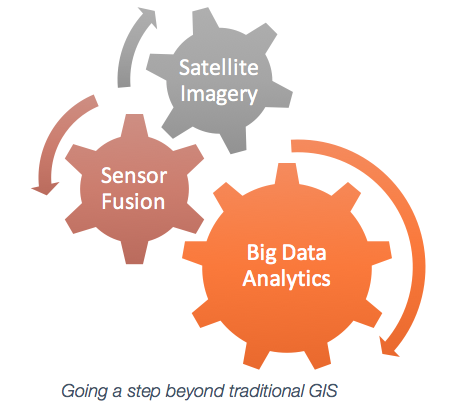 For example, there is a whole new ecosystem of Earth Observation (EO) downstream applications ventures that want to go beyond traditional Geospatial Information Systems (GIS) but using satellite data with ground based sensors in creating data stacks that can add specific industry and decision intelligence to an array of industries. The Low Earth Orbit (LEO) constellation based satellite services including internet, IoT, AIS, ADS-B, GPS-RO, which shall integrate into different B2B, B2C offerings that shall be completely agnostic to what happens in the government procurement realm. There is no doubt that a large percentage of NewSpace ventures may fail and the market size of several of these services may be limited to a few players. However, there is no doubt that many of these services are required today and can complement or integrate into industries on the ground. The proof of availability of several reliable and scalable (hardware/software) platforms, trends towards low-cost access to space, integration into industry 4.0, global business models are some of the key reasons for new actors to consider investments into NewSpace. NewSpace initially fueled by private investors has now arguably lead to States to take note of the opportunity leading to several State actors now looking to pursue investments and creation of regulatory frameworks that shall allow space resource utilization. The latest prime movers in this front are States such as Luxembourg and the United Arab Emirates which intend to offer an attractive overall framework for space resource utilization related activities, including but not limited to the legal regime. These governments are parking dedicated funding to R&D in technologies related to space resource utilization, in line with the ambition to become if not international, regional hubs for the exploration and use of space resources. India’s space program dates back to the early 60s and today stands in the midst of major achievements including having homegrown reliable rockets, satellites providing impetus to space applications serving the needs of man and society. However, the entire value chain from upstream to downstream is mostly occupied by the government ministries/organizations. There are no independent verticals (EO, navigation, communication) in which there is upstream to downstream connection that is entirely private sector driven. Due to sheer increase in the space-based services required in the country that has expanded its footprint in all EO, navigation and telecommunications, the private sector is now being engaged in creating an Assembly, Integration and Testing (AIT) consortium of industries to produce navigation satellites and a Joint Venture (JV) for producing the Polar Satellite Launch Vehicle (PSLV). These strategies are possibly the next step in closing the gaps of State-led requirements in areas of use of geospatial data, navigational services and telecommunications. While these measures are a welcome step in closing on the current requirements, there are new services that are emerging across the world that are not charted into the current roadmap of the Indian Space Research Organisation (ISRO). These include providing low-latency, high-bandwidth internet based on LEO satellites, integration of a wide array of communications services including AIS, ADS-B, IoT, etc., small satellite constellations in EO for bringing in Volume, Velocity, Variety, and Veracity (4Vs of satellite big data). These services are already being planned by several NewSpace players across the world and given the demand the growth trajectory of India, have an extremely meaningful role if integrated into the Indian consumers & industries. The question really is about the approach. There is no doubt that a successful space agency such as ISRO can plan and provide all of these services over a course of time. However, these need the planning of services, appraisal for budgets by the Government of India and then execution. Given that ISRO has already charted a roadmap to develop over 70 satellites up to 2021 to meet the current demands, any additional requirements of satellite services may not fit in the execution within timelines of the next 3-5 years (unless there is a substantial commitment by the Government of India to expand the budget of the space program). Therefore, while there is a substantial movement towards the production of more launch vehicles and expansion of services driven by ISRO, there is enough room for NewSpace to act via development of complementary products and services. We now see a beginning of NewSpace in India where entrepreneurs are for the first time risking the development of space-based products and services which are primarily targeted at B2B, B2C markets. The landscape of NewSpace in India is moving in both upstream and downstream and has a possible potential to expand over the next few years. Several of these NewSpace companies have now been operations for over 3-5 years and have been backed by private capital at various stages. The emergence of the NewSpace in India is despite there being any dedicated or formal start-up incubation/acceleration programs in the country with entrepreneurs mainly looking for support in terms of advice and consultancy based on the heritage established within the space program (both in terms of manpower and infrastructure). It should also be noted that there are no particular institutional risk capital investment cases in India for any of the NewSpace companies. 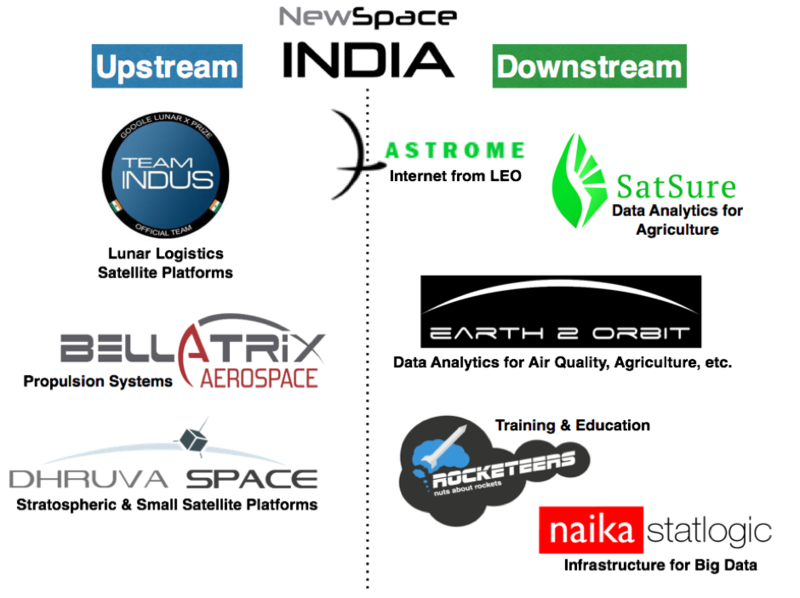 Most of the NewSpace companies have been primarily be funded by grants and High Net-worth Individuals (HNIs), who can relate to synergies created in technology sectors like Information Technology (IT) and Bio-Technology (BT) to be replicated in the space sector and would like to be a part of the ecosystem creation in the nation. Therefore, there are significant differences in the nature of the ecosystem when one compares the NewSpace entrepreneurial dynamic in India from across different geographies. Despite several of these inherent challenges in the foundation for commercial space ecosystem, Indian NewSpace entrepreneurs have identified possible commercial opportunities to create a niche for themselves by creating proprietary technologies that they can possibly scale to users across the world. NewSpace in India brings along challenges in the governance of the private sector attempting to create independent capacities in both upstream and downstream. The current framework for the administration of the space is mostly G2G, where most of the regulatory requirements for licensing, launch, operation and distribution of spacecraft and space-based services are mostly performed within the realm of organizations within the Government of India. For example, the frequency allocation and coordination are done by the Wireless Planning Commission of the Department of Telecommunications for ISRO to fly its satellites. Similarly, EO data distribution to Indian users is performed by the National Remote Sensing Centre (NRSC), an arm of ISRO dealing with remote sensing data reception, processing and dissemination to users. However, with NewSpace companies planning to build their own satellite platforms capabilities in upstream and with space-based services and big-data platforms emerging on the downstream, there shall emerge a host of challenges for the issues such as frequency allocation & fleet operations (setting up ground stations & data distribution), licensing of remote sensing satellites, launch authorization of spacecraft in line with the Outer Space Treaty (especially when foreign launcher is procured by an Indian company), among others. It has to be noted that India has a defined framework for the participation of the private sector in the commercial communications services realm where a SatCom policy was put into almost two decades ago via making an application to the Committee for Authorizing the establishment and operations of Indian Satellite Systems (CAISS). This allows private Indian companies with a foreign equity less than 74 percent to establish Indian satellite systems. Under this policy, the CAISS is responsible for private operators to be provided with authorization to operate the satellite and the orbit spectrum notification/registration. However, the Department of Telecommunication for telecom services and Ministry of Information and Broadcasting for TV/Radio broadcasting shall provide the operating licenses for services. Given the proliferation of EO in private sector on the upstream across the world only recently, the potential participation of Indian private companies in EO was possibly not foreseen. Today there still lies a gap in authorizing (frequency allocation, operations, launch, data distribution) where the private sector wants to establish a complete capacity to sell EO services. Since a transparent regulatory framework has a strong effect on attracting large scale investments especially from private risk capital. Given the nature of the space industry, high sums of capital investment remain one of the fundamental requirements for expansion of upstream capabilities for NewSpace India companies in establishing end-to-end platform capabilities. Similarly, a transparent data policy to use multiple sources of data (national & foreign) to be rolled out into geospatial services by the downstream companies for requirements within government agencies and the private sector needs to be addressed as well. Therefore, it becomes necessary that an ecosystem perspective is taken to encourage NewSpace in India in creating an independent, single-window led, time capped framework taking into account both upstream and downstream requirements across the value chain. There is no doubt that India’s NewSpace entrepreneurs can leverage the infrastructure and the capacity created over five decades of investments into the space sector by the Government. The country stands in a realm of several complementary and convergence technologies that is enabling several new space-based services that are waiting to be tapped for economic and societal benefits. Within India’s own ecosystem, there are significant opportunities for NewSpace to complement efforts of ISRO and provide new and innovative services. Today, there is a combined responsibility for the NewSpace entrepreneurs in India to come together and create a community that shall pursue the expansion of the space economy of the country. A community creation drive should work towards benefiting everyone within the ecosystem (across the value chain) and lead to creating a holistic environment for triggering changes in the policy realm, bringing in investor confidence (especially from an institutional investment perspective) and possibly opening up the drive for foreign direct investment (FDI), which can ultimately lead to a greater global integration of India’s space supply chain.